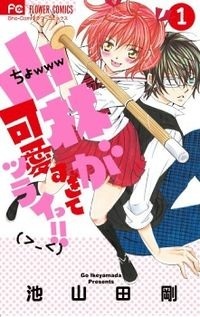 Recommendations: Kobayashi ga kawai sugite tsurai! Mitsuru and Megumu are twins. They go to different schools and one day decided to switch places. During their school switch, Mitsuru (boy) falls in love with a girl who cannot hear. Meanwhile, Megumu (girl) falls in love with this mysterious guy with an eye patch. Therefore, Mitsuru and Megumu continue to switch schools but they can't tell anybody! The art is great! I MEAN GREATTT. The eye patch guy is super good looking. It's cute how the main characters (the twins) fall in love at the same time. I like this manga and would recommend it! New manga alert! I read chapter one and one word screams out to me: CLICHE. This first chapter was incredibly shoujo manga predictable. I didn't like it. The dialogue/narration is SO SO CHEESY. Like seriously? "Archery club, 2nd year, Ousaka Kanade-kun. Just after he entered this school, 2/3 girls in our school fell in love with him." WHAT. 2/3?! THAT'S A LOT OF GIRLS. Such a typical "popular-guy-likes-quiet-girl-who-crushes-on-him-from-afar" manga. Mikan Sakura is an orphan who lives in the country side of Japan. When her best friend, Hotaru, transfers away to a prestigious school in Tokyo, Mikan follows her. The school is actually an elite academy for the gifted people with “alices”. When Mikan arrives at to the gates of the school, she encounters a teacher and gets enrolled due to a series of events. She is told that she has a unique, rare “alice”. 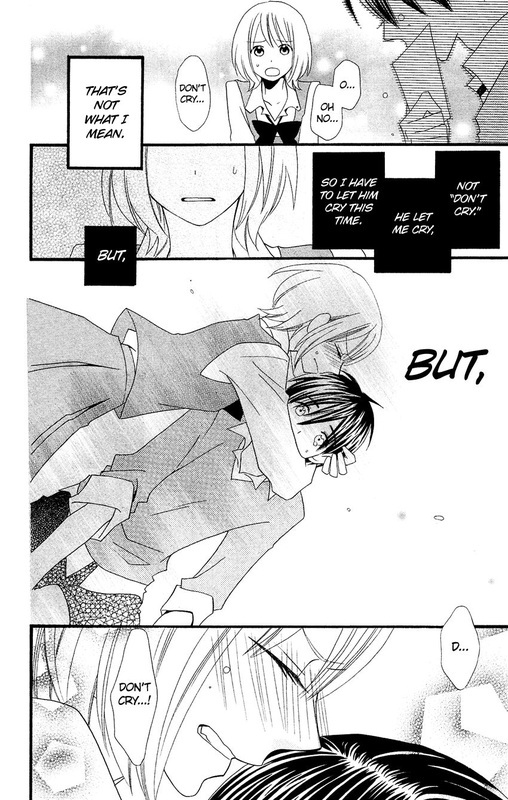 There, she immediately meets Natsume, a moody boy who constantly gets abused by the school. They get along like fire and water, yet they are unmistakably attracted to one another. She also gets the chance to meet other people, like Natsume’s caring best friend Ruka, or Iinchou, the class rep. Despite her initial view of the so-called greatness of the school, she slowly finds out that beneath the grand facade of the academy, there is a never-ending stream of lies and buried secrets. The school’s increasingly manipulative and sinister actions towards her make it a dangerous place to be. Little does she know, her enrollment in the school set the gears in motion to a greater tragedy. The manga series has ended with Chapter 180 called Finale. Although I stopped following the manga because it got confusing, I still feel something knowing that it just ended. Seeing the "Completed" status just gets to me. My experience with this manga is maybe different from others. Gakuen Alice was one of my first favorite animes and manga series, which explains why I'm so attached to it. I remember being OBSESSED with the anime and manga. I even had a crush on Natsume for the longest time! This series means a lot to me, it will always have a place in my anime/manga heart. It has really come a long way. 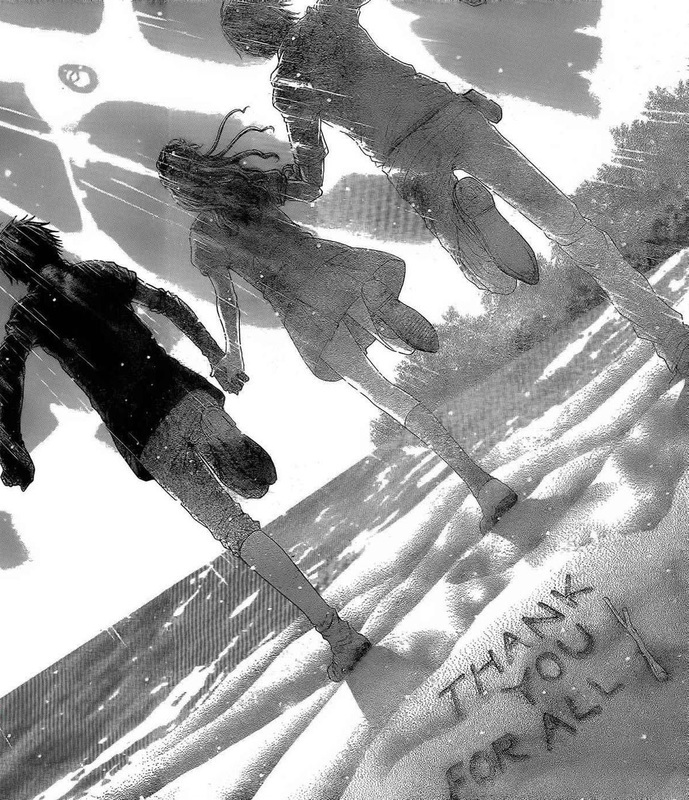 Yes, Thank you for everything Gakuen Alice. All I can say is: FINALLY. The main character, Mairu, and her stupid cheating boyfriend FINALLY broke up. Seriously! These past chapters have been about her being depressed over Naru kissing another girl. This whole breakup arc was longer than it should've been. I'm so glad that they broke up though. To be honest, I kind of liked Naru...but it's obvious she's going to end up with the other dude. Well yes he is dying but obviously we know that he is not actually going to die. This is called the Protagonist's Law. Summary:Tsubaki is a girl who loves making her younger sister's hair pretty every morning, but she doesn't think that kind of style suits herself! The day of her High School Beginning Ceremony, after she failed in being the top student, she finds herself sitting next to the actual top student of the first years, the worst, rudest guy ever, Kyouta. She ends up cutting his hair on purpose because of the awful things he says to her. 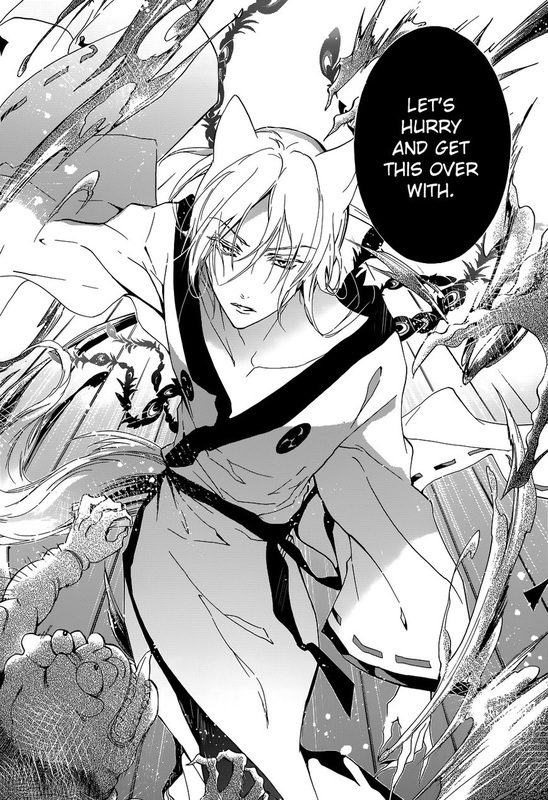 Kyouta demands that Tsubaki pays him back with her body. 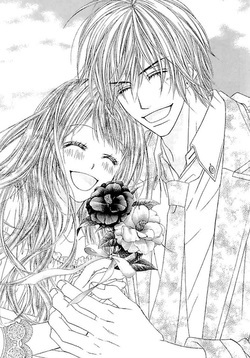 Kyouta unexpectedly kisses Tsubaki and swears that he'll take away all her firsts. Probably the most frustrating manga ever. The manga has finally ended with 99 chapters - honestly, I cannot bear to see it go on. I started this manga Sophomore year in High School and now I'm halfway through my Senior year. Although the heroine annoyed me to no end, I still feel something now that it has ended (I mean, I followed it for two years). This means I won't be looking forward to any more updates (isn't that...sad). Anyways, back to the real review of the manga. The manga is interesting but not what I would recommend. The heroine gets super jealous and is hella insecure. I know that people like that exists....but...I couldn't stand her. I contemplated to stop reading this manga, but for some reason it still pulled me back. OMG ONE OF MY FAVORITE MANGAS GOT UPDATED!! In this chapter, Kyouya forgets his contacts and at school his glasses get stepped on. So, he has to go though the whole school day with blurry vision. Erika decides to be his "eyes" and well...he realizes that prefers seeing his girlfriend clearly. Super cute! Yes, I am reading a sports manga. 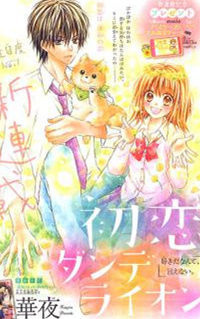 This manga is good enough for me to read because normally I only read shoujo manga. This sports manga, however, is an exception. 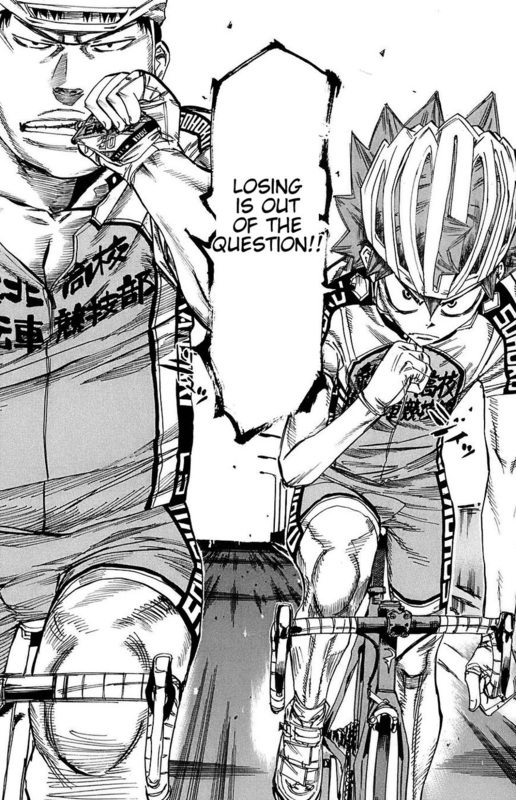 Yowamushi Pedal is the type of manga that updates in chunks. When I saw this an the updated list, I went "OOOOOHHHH!!!" BUT IT'S AN EXTRA!! Normally I really really hate extras. This one on the other hand was extremely cute and interesting. This extra was about how the heroine's (Hinata) parents met. AWW SO CUTEE!! I enjoyed it!